Philip Klass, Thomas E. Bullard, et al. Following Martin Kottmeyer's article in Magonia 54 suggesting the famous 'Father Gill' case - when an Anglican missionary and some of his parishioners in Papua New Guinea saw a UFO with humanoid occupants - was actually the misidentification of brightly illuminated squid boats in the nearby bay, Magonia received letters challenging this theory, including one from celebrity skeptic Philip Klass, who has himself been vigorously challenged for his own contention that the affair was a joke which ran out of hand. It was so reassuring to be told by Martin Kottmeyer that although the Gill case is "an impressive anomaly", it is "of course not impressive enough to make me believe in visiting extraterrestrials", After all. we would not want the armchair readers of Magonia to be disturbed in their complacent view that everything can be explained by recourse to the social sciences and folklore. But my confidence in Kottmeyer faltered when I saw that although he mentions Cruttwell twice he does not seem to have consulted the Rev. Norman Cruttwell's exhaustive investigation of the Papua and New Guinea sightings of 1958-59. for if he had he would have realised that the Gill sightings of the 26th and 27th June were but two of over seventy reported UFOs during the wave, which ranged from lights in the sky to seemingly structured solid objects. It would be disappointing if Magonia were to be no different from all those other UFO magazines busy bolstering up the belief systems of 'New Agers', abductees, etc. all too willing to be economical with the facts when they don't suit the dogma I am still convinced that despite our growing sophistication concerning earth lights, altered mental states, psychosocial forces etc., there is still a signal behind the noise that says that the most convincing explanation for the Gill case is that they all saw exactly what they said they saw up there. In case anyone is interested the Rev. Cruttwell's report was printed in full in Flying Saucer Review special issue number 4, published August 1971. Yours sincerely, Michael Buhler, London El. I read with great interest Martin Kottmeyer's article about the sightings of Father Gill of Papua New Guinea (Magonia 54). Let me bring forward some comments. The elevation of the phenomenon is perhaps the major pitfall of the boat hypothesis. Note that Father Gill stated the following: "Venus was in its proper place, and then further up, more or less overhead, was another Venus" (Basterfield, p.21). By the way, another mention can be found in the text omitted in one of Kottmeyer's quotations (paragraph taken from reference 17 in Magonia, page 13). the missing fragment reads "Well, why not wave to people up there? So we did." Finally it would be interesting to take a closer look at the details of the drawings and the circumstances in which they were made. We are told that the witnesses did the sketches independently. But why are the drawings of Rarata and Guyorobo so similar? And what about the way the witnesses choose to represent the upper shaft of light so conventionally with a broken line? Has it any relevance that the object depicted by Father Gill is literally a 'flying saucer' while the sketches of Rarata and Guyorobo seem to be more akin to the spaceship of Adamski? By the way, is there any clue as to what the three rods on top of Rarata's and Guyorobo's drawings mean? Light rays? People? Aerials? I. The UFO of June 27 was an all terrain vehicle, crossing both land and sea. Though most descriptions are unclear, Rev. Gill said in a talk, four months after the event that the object "wandered over the sky a bit". passed behind a hill, came back, then "shot right across the bay" (Keith Basterfield, An in depth review of Australasian UFO related entity reports p.27). 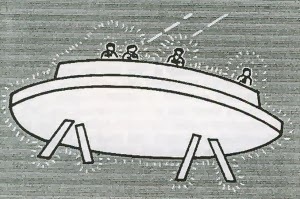 Allan Hendry's illustration (UFO Handbook p.274) approved by Rev. Gill, shows the UFO over land during the waving incident. 2. Even assuming gross error and the 'UFO' really was a boat, it had to lie close to shore. Gill's distance estimate of 300 - 400 feet suits the proportions of the beings in his illustration, if they are of average height, and a location in the northwest or west assures that the boat stayed close to the westward-running shoreline. The sea is not a lake and seldom becomes mirror smooth. A boat near to shore would have breakers and the unsettled weather of a night with intermittent rain to spoil the illusion of doubling or a false horizon. 3. Why would a squid-fishing boat work the shallow waters of a bay, if the purpose of the bright lights is to lure squid from the depths? 4. The most important point is that the UFOs were clearly seen in the sky. Gill describes the craft appearing above Venus, and Hendry (p.l34) cites a 45-degree angle of elevation during the waving episode. Even allowing for a great deal of error in angle estimates, the witnesses would have to be remarkably disoriented to mistake a horizontal for an elevated line of sight. On the 27th it was not even dark, and given a background of shore and mountains two miles away to the west, opportunities for disorientation were minimal. The witnesses knew they were looking up. Too many irreconcilable facts scuttle the boat theory. Despite my long-standing admiration for Martin Kottmeyer, I must challenge his inadequate characterisation of my views on the Rev. Gill New Guinea UFO case of 1959 in his article in your November issue. According to Kottmeyer, "Klass suggested it was a hoax". A more accurate characterisation, as detailed in my book UFOs explained is that I believe the incident was a practical joke that went astray. Gill's associate, Reverend Norman Cruttwell had become very interested in UFOs and had been named an official UFO observer in New Guinea for Flying Saucer Review. Crutwell asked his other missionary associates in New Guinea to assist by reporting local UFO sightings and many did so promptly. But it was almost six months before Gill reported his first UFO sighting to Crutwell, who gently chided Gill for not being more attentive. On the night of June 26, 1959, Gill reported sighting a bright light in the sky around 6:45 p.m. and he reported that he and some natives spent more than four hours observing this UFO and what appeared to be human-like creatures atop it. The next night around 6 p.m., the natives alerted Gill that the UFO had returned and he joined them on the beach. As Gill later reported to Cruttwell, they could see human-like figures on the UFO. Gill reported that when he waved at one of the creatures, "the figure did the same". Soon the UFO appeared to be approaching the shore, as if it were going to land. What an exciting moment that must have been perhaps Gill and his native friends would be the first Earthlings to shake hands with extraterrestrials! But then, according to Gill, "at 6:30 p.m., 1 went to dinner". ETs could wait, the 'inner man' needed to be fed. At 7 p.m. Gill returned to the beach, but now the UFO had moved away and so he departed for church services. Gill reporting these exciting events to Cruttwell in a letter that began: "Dear Norman: Here is a lot of material the kind you have been waiting for, no doubt; but I am in some ways sorry that it has to be me who supplies it. Attitudes at Dogura in respect of my sanity vary greatly, and like all mad men, I myself think my grey cells are O.K .... "
It is my view that Gill was pulling Cruttwell's leg, and never suspected that Cruttwell would take his fantastic (for the 1959 era) tale seriously. Once Cruttwell had publicised Gill's story, it would be awkward for Gill to admit that he never dreamt that his associate would be so credulous. I do not believe that Gill intentionally created a hoax tale to try to embarrass his good friend and associate. Sincerely, Philip J. Klass, Washington, D.C.